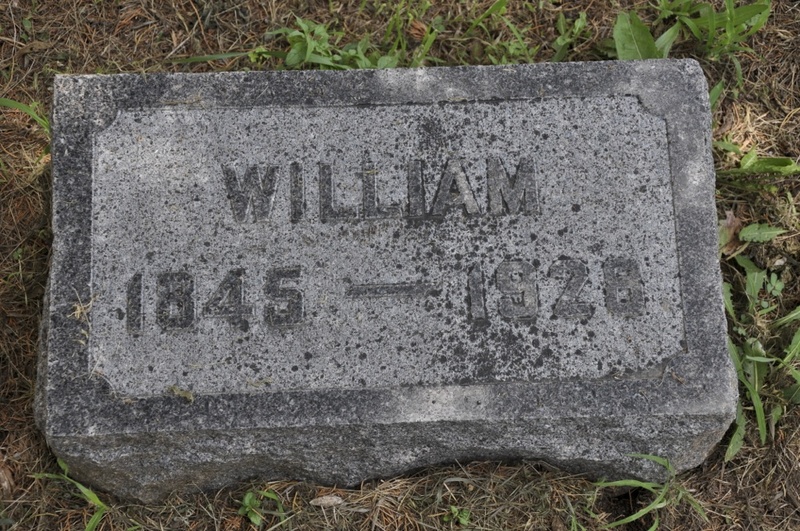 Billy was only 17 years old when his father died in 1862, and his youngest sibling, Mary, was only two. It’s not clear how long the family stayed in the dairyman’s cottage on the castle grounds, but two years later, according to the 1864 directory, Mary was living in Killoch Cottage on Midton Road. I fear that the work of a dairyman, even with the help of a dairymaid, would be too much for a single mom to handle. Probably Mary and her eight children were “let go” from the property to fend for themselves pretty quickly after Wm. Robert's death. Billy and his older brother, David, would’ve taken over as the breadwinners of the family, helping to raise their siblings. But instead of remaining as a farm laborer, over the next seven years, Billy and David learned the skill of carpentry, most likely working in the ship-building industry. Considering the living conditions on a farm, even a farm next to a castle, any industry would seem like an improvement. While growing up in Maybole, Ayrshire, in the mid-19th century, Billy witnessed firsthand a transformation of Scotland through its industrial revolution. Although the county of Ayrshire remained predominantly rural, it too saw a tremendous growth of iron foundries, coal mines and ship yards. 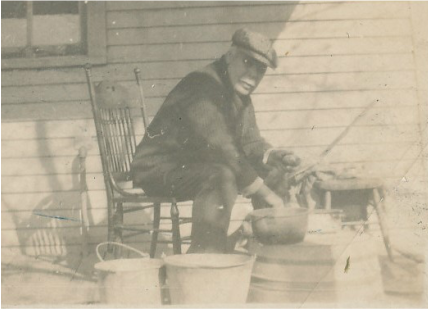 Billy would have been no stranger to hard labor, beginning first with the farm chores in his youth and then in his narrowing prospects as he grew older. Because the main industries during that time, besides agriculture, were coal mining, ship building, iron foundries and fishing, working conditions in any occupation left much to be desired. In fact, it was near Ayrshire that James Keir Hardie first began Britain’s Independent Labour Party. Hardie witnessed firsthand the harsh conditions in the coal and shipbuilding industries and began a conquest for unionization and improvements. He is Scotland’s equivalent to our Jimmy Hoffa. And now begins the perfect storm, rumbling with thunder as it back builds, ready to unleash its fury. Billy knew that he would never own the land he cultivated as a boy, nor the dairy where he worked tirelessly as a teenager. His children would have to grow up in his footsteps as either a farmer or dairyman, or at best, work in manufacturing or in a factory. As the time neared for Billy’s decision to depart from his home town of Maybole, the economy of that area was declining rapidly, adding to Billy’s unrest. Almost all of the weaving industry became mechanized, displacing many weavers from their occupation. The cotton industry began to slow tremendously, adding more workers to the ranks of the unemployed. The iron industry also began to weaken as supplies of local iron ore declined and imports grew dramatically, adding substantially to building costs. There was no such thing as unemployment compensation at that time. In fact, Scotland’s poor laws didn’t cover the “able bodied.” So as the population of Ayrshire increased from people looking for employment and also from an influx of Irish immigrants, the economy grew worse and worse. And then there was the potato famine. Growing potatoes in the coastal areas was a tricky business. The weather and soil conditions were ripe to cause potato blight, a destructive fungal disease that causes the potato to suffer from dry brown rot, like a potato that’s been left in the bag too long. As the famine continued, relief efforts began and over the years the relief programs became semi-permanent. Crofters were given oatmeal rations, and had to work eight hours a day, six days a week for their rations. This work came in the form of building roads, called destitution roads. The administration of these programs was very bureaucratic, requiring a heavy labor force of clerks to ensure the crofters complied with the program’s set of complex rules. In other words, it worked about as efficiently as our welfare programs work today. In addition to the high rate of unemployment, a caste-like system of land ownership, the practice of primogeniture, and the potato famine, Billy’s decision to leave Scotland had to have included the promise of owning cheap land by the persuasive and smooth-talking agents of the American railroad companies and ship-owners. The picture they painted of the United States was grand enough to entice men to become indentured servants in order to be ferried across the pond. It was on these ships that approximately 30% of people died, which is why they were aptly named coffin ships. So Billy had a decision to make - either get busy staying or get busy leaving. It was not surprising then, that Billy and his best friend John Wright decided to follow in the footsteps of other hopeful Europeans and hopped a schooner called The Seven Brothers in search of their dreams in America. The year was 1870. One of my favorite stories about Billy's departure is how he went to visit John, purportedly to say goodbye to his life-long friend. Unbeknownst to his parents, John had already stashed his belongings down at the docks. So when John went to the docks with Billy to "see him off," he hopped aboard the schooner and sailed with Billy to America. It reminds me of a Scottish Tom Sawyer and Huck Finn. A year prior to their arrival in the U.S., the first Transcontinental Railroad had just been completed, leaving other areas of America hungry for the railway, including Kansas. One of the draws which enticed people to settle in areas along the railroads was the cheap cost of land, between $4 and $7 per acre in the Sherman Township – the most desirable being $7. The Civil War had ended just five years prior. Indians were being relocated from desirable lands through government treaties. (Click here to find out where all of the Pottawatomie Indians went) Ulysses S. Grant held the presidency and ratified the 15th Amendment, giving Native and African-Americans the right to vote. With the promise of a richer life and cheap land, what better time was there than this to come to America from an impoverished and starving area of Europe? Between the years of 1870 and 1900, over 12 million people thought the same thing. “Give me your tired, your poor, your huddled masses yearning to breathe free,” Lady Liberty beckoned them to come. 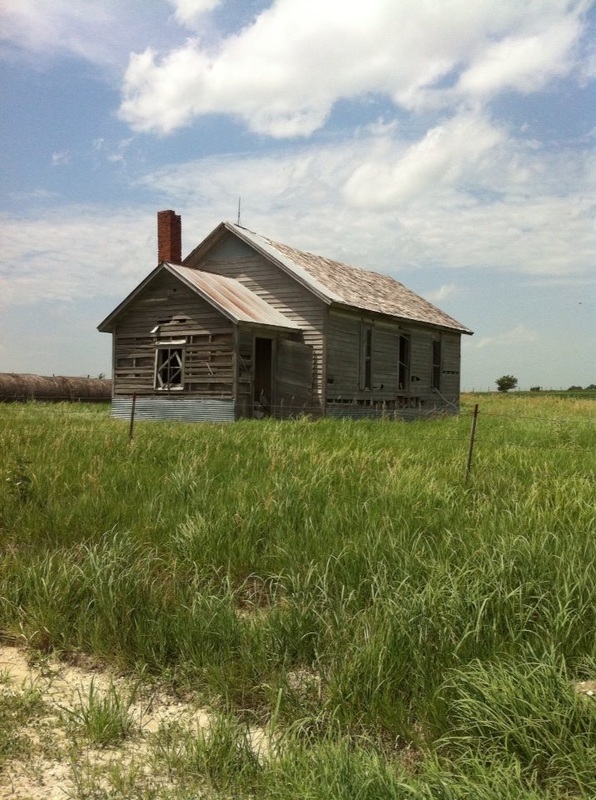 But it was the beautiful Kansas prairies that made them stay. Billy's life as a Scottish immigrant. It's not certain if Billy and John Wright knew James Mair (1843-1915) from East Ayrshire, Scotland, prior to sailing for America, but since they're all from Ayrshire and in 1870, the same year they sailed from Scotland to America, Billy and John lived with James and his brother's family, I would imagine that they did know each other prior to the trip to America, and could possibly have traveled together. The 1870 census shows that Billy (age 24), John (age 27) and James (age 24) lived with John & Catherine Mair (ages 28 and 27) and their two children [named after John and James' parents]: Alan and Mary (ages 2 and 2 mo). The area where they lived was called "Ward 6" in Lawrence, Douglas County, Kansas, along the swampy shores of the Kansas River. Living in this area would later play a role in where Billy, John and James decided to purchase land. Billy and John went to work for the Union Pacific Railway laying tracks from Kansas City, Missouri, to Wallace, Kansas [near the Colorado border]. Just a year later, Billy applied for his citizenship on May 29, 1871. In doing so, he had to renounce forever all allegiance to Queen Victoria and all of Britain. I wonder if he ever held any hesitation in doing so. Also in 1871, the great Chicago fire burned from October 8 to October 10, destroying thousands of buildings in a swath about four miles long and one mile wide, killing an estimated 300 people, and causing an estimated $200 million in damages. 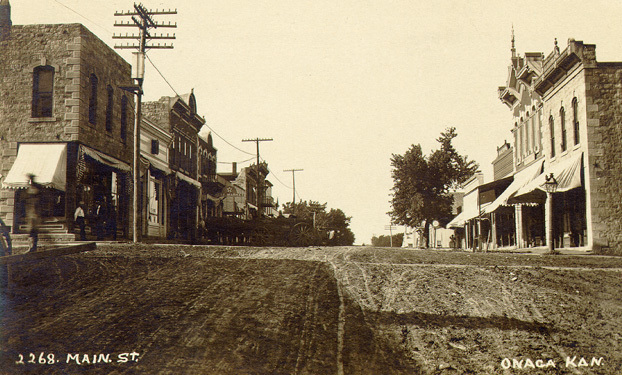 Following the blaze, reconstruction efforts began quickly and spurred great economic development and population growth. Billy and John joined the hundreds of other builders, architects and engineers to help rebuild the city. For their efforts, they earned enough money to buy cheap land being sold by the railroad. In Lawrence, the swampy area along the Kansas River was riddled with mosquitoes that carried a form of malaria called ague fever. 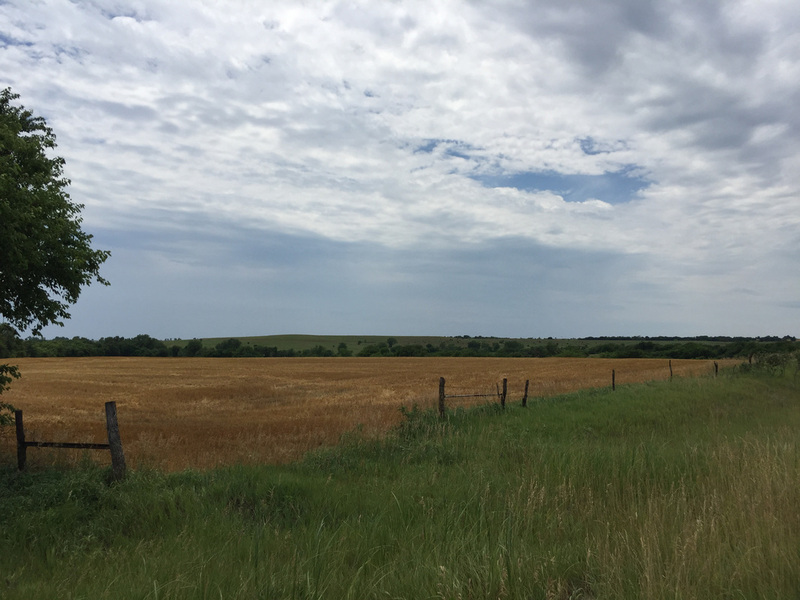 So instead of returning to where James' brother lived, they chose instead to purchase a section of land (Section 23, Township 7, Range 10) upon the hills in Sherman township, Pottawatomie County. They purchased this land from the railroad for $7 per acre for the east half containing Coal Creek, and $3.50 per acre for the west half. John took the south half and Billy took the north half. Billy, John Wright and James Mair hired a man with a team of oxen to plow furrows around their land as a marker. Of course today the borders are marked by dirt roads. 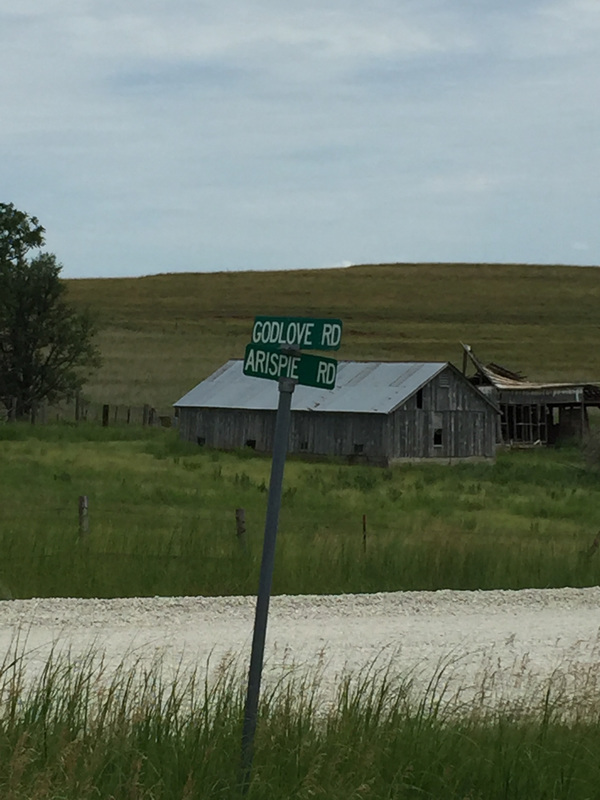 July 2016 - at the SE corner of the property, now the intersection of Godlove Road and Arispie Road, looking NW. But before they started to build, James sold out his share to Billy and John. James Mair later moved to Maryland and is buried with his wife, Mary, in a small mining town called Eckhart Mines in Alleghany County, Maryland. 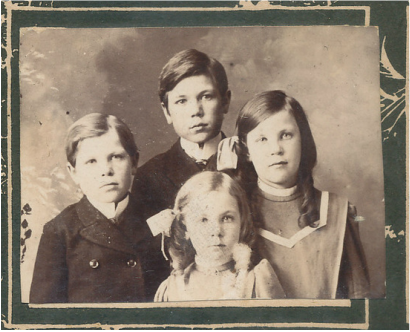 A side note about the Mair's - five years prior to Billy & John's arrival in America, James' mother, Mrs. Mary Fowles Mair, kidnapped her youngest children - Mary (14), Andrew (10) and Alexander (7) and took them from Scotland to the U.S., via the Morman church and settled in Heber, Utah. The children never saw their father again. I wonder if that was one of the reasons why James Mair also decided to come to America, either to get away from his father in Scotland, or to find his mother and siblings. Nevertheless, I think we have Mr. Mair to thank for our family settling in NE Kansas. In 1877, Billy built his house and married Jane Neely (1856-1886), daughter of Robert (1828-1890) and Marsha Jane Stone Neely (1838-1884) of Londonderry, North Ireland. He was 32 and Jane was 21. 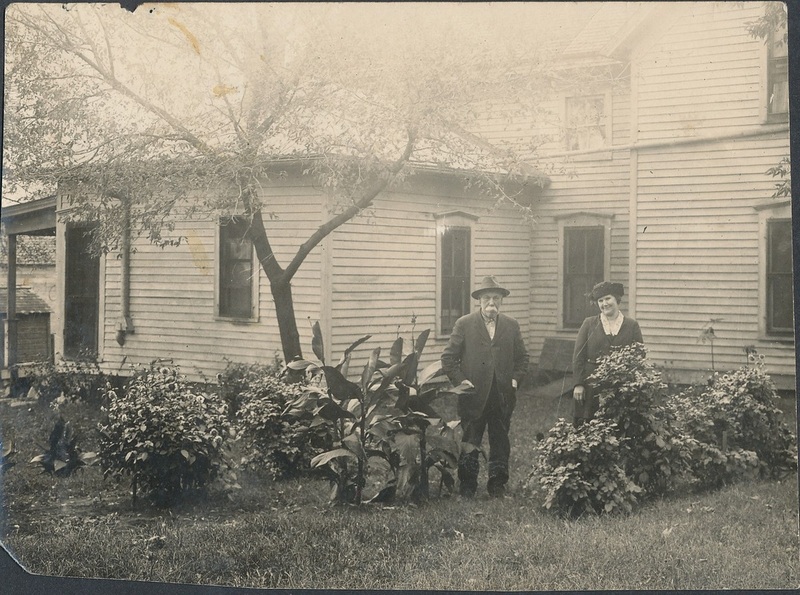 The old house on the farm in Sherman township stood until the 1960's when it was demolished and another house was built on the same site. 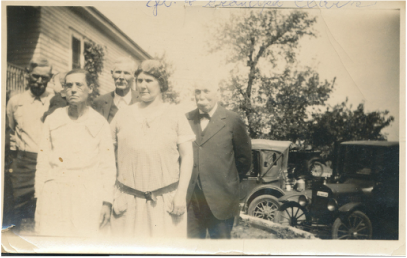 Billy and Jane were blessed with four children - William Jr. (1878-1965); John Robert (1880-1942); Mary (1882-1963); and Agnes (1886-1982). It was the year that Mary was born when Billy helped build the Union Ridge Fox School, and a year after that Billy was granted citizenship. Billy tried to protect his family from ague fever, but he couldn't protect Jane from contracting tuberculosis. 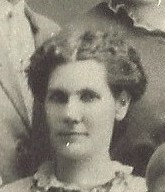 She died at the age of 29 on June 15, 1886, leaving Billy a widower with four children to raise. 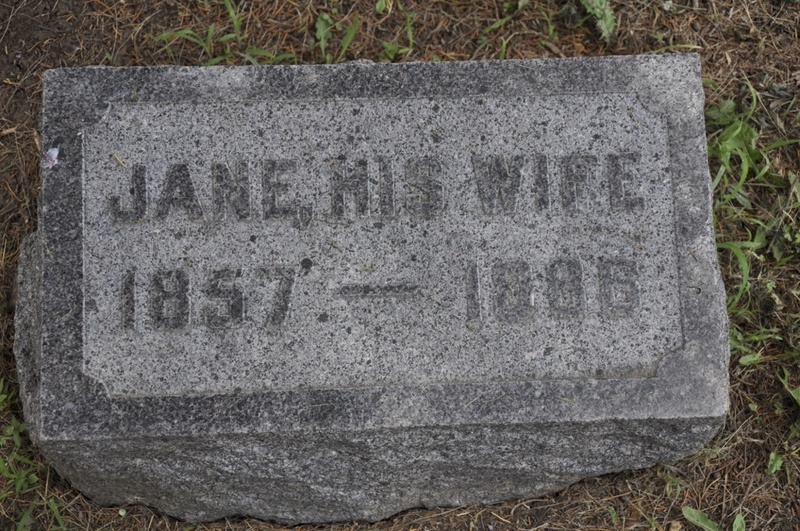 Jane was buried at the Fox Cemetery in Wheaton. Billy would stay a widower for two more years. Taking some artistic freedom here, I'd like to interject what happened next. According to two other sources on Ancestry.com, after Jane's death, her sister, Mary, was already planning to marry someone when her father 'gave' her to Billy after he demanded a replacement for Jane. Billy Clark was a very close friend of Robert Neely. So Robert gave the needed parental permission for the forced marriage of Mary to her brother-in-law; which occurred on Mary's 16th birthday (the first day it was legal). This caused Mary to become a bitter, bitter woman to end of her life. She treated Jane's children very badly. Everyone said Mary would be better once she had her own children, but she treated her own just as badly as her sister's. John Robert and his siblings never really gave her a chance to be liked by them and they accused her of starving her youngest child, Isla, to death. Isla died from dysentery. Mary was miserable and went a little crazy. Myrtle Neely felt very strongly that her grandfather was responsible for destroying Mary's life and making miserable the lives of all those children. 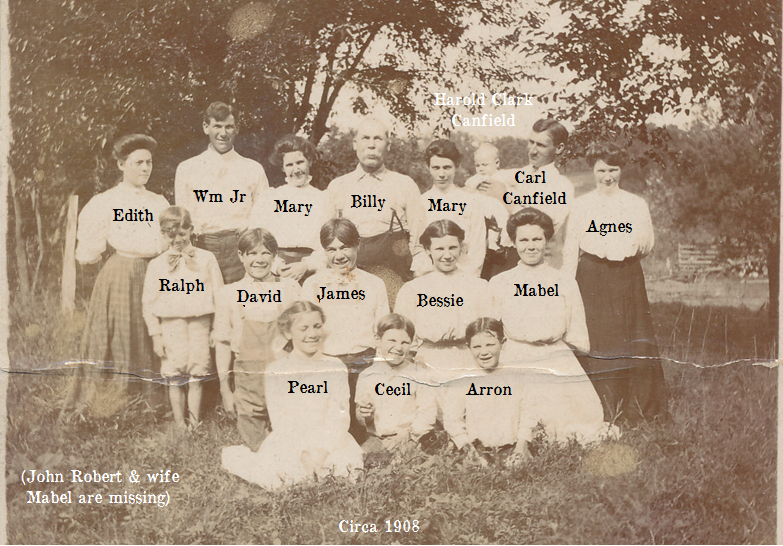 Having said that, Billy and Mary had eight more children: Mabel (1889-1966); James Milligan (1891-1941); David (1893-1986); Bessie Velma (1895-1943); Pearl (1897-1946); Cecil (1899-1970); Arron (1901-1965); and little Isla (1905-1906). Billy retired from his farm at the age of 65 and moved to Onaga in 1909, at which time his son, John Robert, worked the farm until 1928. Then Billy's other son, Dave, worked the farm until 1956, and then Dave's son, Lawrence, took over. Lawrence passed away in 2010 and passed the farm to his daughter and son-in-law, Nancy and Charles Valburg, who live in Onaga. After many unsuccessful attempts at contacting the Valburg's for additional information, the ownership information above was gathered from county records. In his later years, Billy had two vices - eating English walnuts and drinking Coca Cola. [I'm thinking he probably had more than two vices, but let's move on] After he moved to town he would walk down to the local drugstore every day for a Coke. His youngest children and grandchildren would watch out for him and catch him in the drugstore so he would buy them a Coke as well. Billy always raised big red hogs for butchering [remember the cruive? ], even after he moved to town. One day Mary had placed a pan of Jello out to set on the old wooden washing machine. Billy, whose eyesight was clouded by cataracts, thought it was a pan of scraps from the kitchen and dumped it into the slop for the hog. Needless to say, Mary yelled bloody murder! It seems that Mary didn't have much of a sense of humor. Life for Billy began on a farm in Scotland as the son of a plowman; then under the shadow of a grand estate, he worked on a dairy farm; upon the death of his father he started working in the ship-building industry and learned to be a carpenter; with his runaway friend, John, he sailed to America; becoming a part of American history, he worked on the railroad laying track that stretched across the breadth of Kansas; he helped to rebuild Chicago after the great fire; he married two sisters; had 12 children and farmed the beautiful pastureland of northeast Kansas. What a full and exciting life he lived! On January 20, 1928 at the age of 82, Billy breathed his last. 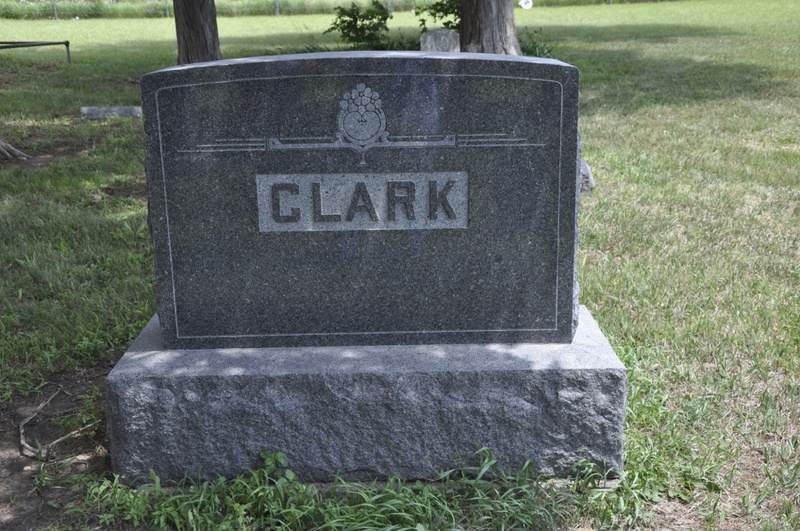 He was the last survivor of his brothers and sisters, and is buried at Fox Cemetery, Wheaton, Kansas. Mary was a young 56 years old when Billy died. She lived to the age of 82 and passed away on January 1, 1954. 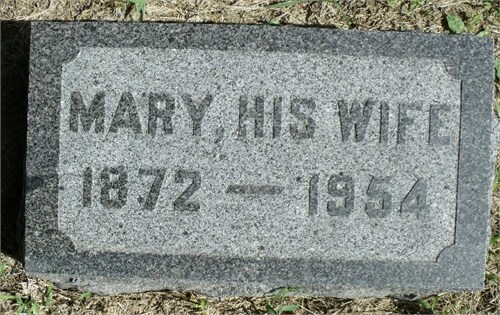 Mary is buried with her sister, Jane, and husband, Billy, at the Fox Cemetery in Wheaton, Kansas. 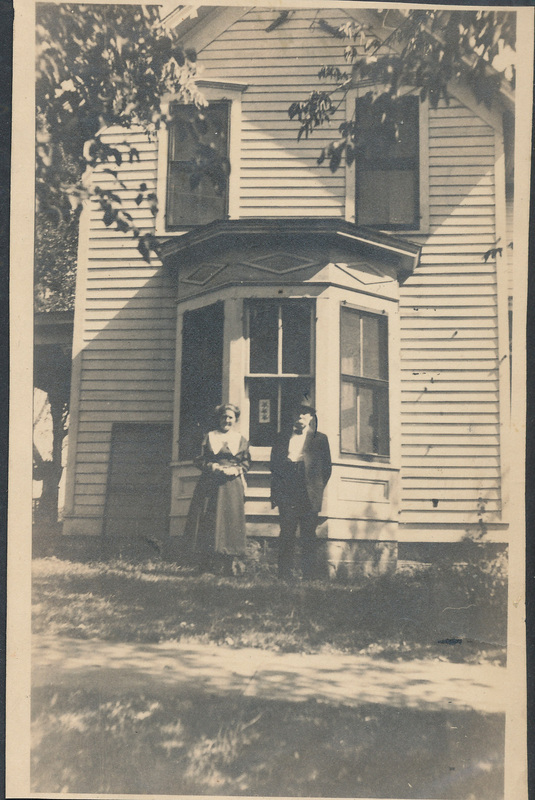 Billy & Mary in front of farmhouse. The paper posted in the widow behind them had on it 3 stars. That stood for their 3 children in the service in WWI - David, Cecil & Arron. 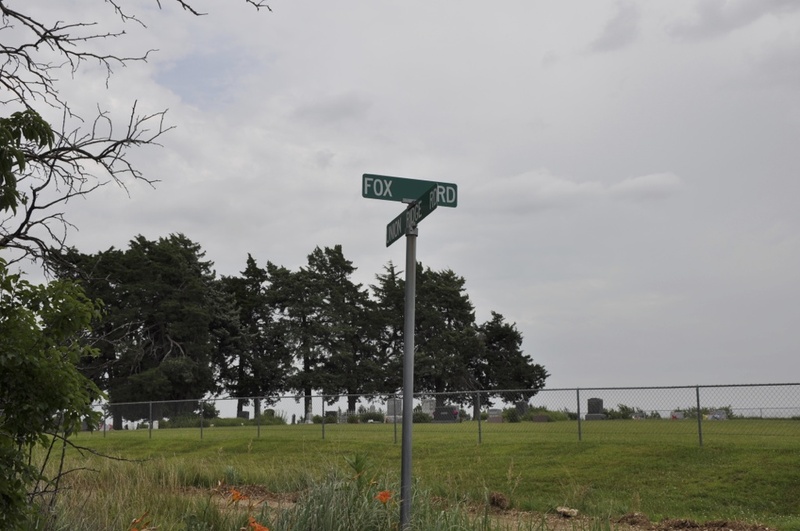 Fox Cemetery in Wheaton, corner of Union Ridge and Fox Roads.